The Italian word, Farro was born from the Vulgar Latin word farrum, meaning a type of wheat. The problem is that with the popularity of gluten-free lifestyles and paleo diets, farro has become a, eh vulgar word. The reality is that Italians have been eating it for centuries and using it in everything from soups to salads. It is not gluten free but is considerably lower in gluten because it is a heritage grain. My research says that it is easier to digest than other forms of grain and wheat. Here, in our town, we’re fortunate that our local flour mill is once again producing heritage grains. Farro is amongst them and in our efforts to eat local food, we had to try it. It’s a full, nutty grain that offers great texture yet blends well with a variety of vegetables and meats. Farro, also known as Emmer wheat, has a host of benefits that can be captured at the dining table. It is full of fiber. A single one-cup serving of farro contains approximately 8 grams of fiber. Even brown rice only weighs in at 5 grams and white rice is much less. Farro, like other whole grains, is full of magnesium. Magnesium is known to relieve tension and is also believed to make calcium more absorbable. Because faro is a complex carbohydrate, it breaks down slowly and not only keeps energy levels stable but may also boost the immune system. Soak farro overnight. Discard soak water and replace with 5 cups of cold water. Add lentils and bring to a boil. Reduce heat and simmer for approximately 40 minutes. In a separate skillet, heat 2 – 3 Tbs of olive oil. Add garlic and onion and simmer until transparent. Add butternut squash and bell pepper and cook unit nearly tender. I added vegetable broth during this process as needed to keep the veg from sticking and to ensure uniform heat. When the vegetables are nearly al dente, drain the grains and add to the skillet, stirring well to mix. Heat through and add curry powder and salt and pepper. Add the uncooked collards at the end and mix well as they will become tender due to the heat of the grains. Enjoy as a vegan main dish or as a side for your meat eaters. Nothing vulgar about it! Do you have heritage grains in your community? Let me know how you like them. It went over well and was gone quickly here. The curry was a late add. I didn’t actually order it this go round. Maybe next time I will be more brave! You know, I was going to say that it was good for cramps and decided that I wouldn’t because I didn’t think of leg cramps. I do get toe cramps sometimes so good to know!! Farro reminds me of barley . . . plump, nutty, chewy. I would definitely make it again. Yes, I like it even more than barley and I believe that it is less inflammatory than barley. Oh, your travels do pay off in the food category, don’t they Tandy? It is hearty and satisfying. Do you have a favorite grain? My resolution for this winter should be to finally make farro. I’ve seen so many recipes for it and have read the benefits, but I’ve never cooked it before. Thank you for the reminder!! I’ll probably be cooking your recipe soon. Except for the soaking, it’s no harder than rice. In fact, would probably do okay in the rice cooker. What whole grains do you typically cook? This sounds yummy and looks great! I’ve bought pre-made farro salads in natural food stores and restaurants, but I’ve never attempted to make it myself. I will definitely give it a try! I think it would be terrific in a salad. In my area, quinoa salads are the big thing although I must admit that it really is hard for me to eat mid-day as it gets stuck in my teeth! With farro, it’s large enough that I don’t have that problem. I have a bag of Farro that I bought at Trader Joes recently and wondered just what to do with it. Fascinating article, and the recipe is one I can try! I didn’t know that they sold it there – do the directions say that you need to soak it? Do you have a Trader Joe’s where you live? In our area, they tag every single GF product and I think it’s easier to shop there with restrictions. Never heard of farro, so I am interested to try it out! You always write something to intrigue and inspire me, so thank you so much! You can get it at the uptown farmers market and also try some of their other products. The polenta is great. Sophie, let me know. At first, I didn’t add the curry but my kids requested it. Give it a shot and if you’re looking for one, try ours from the Hayden Flour Mills. 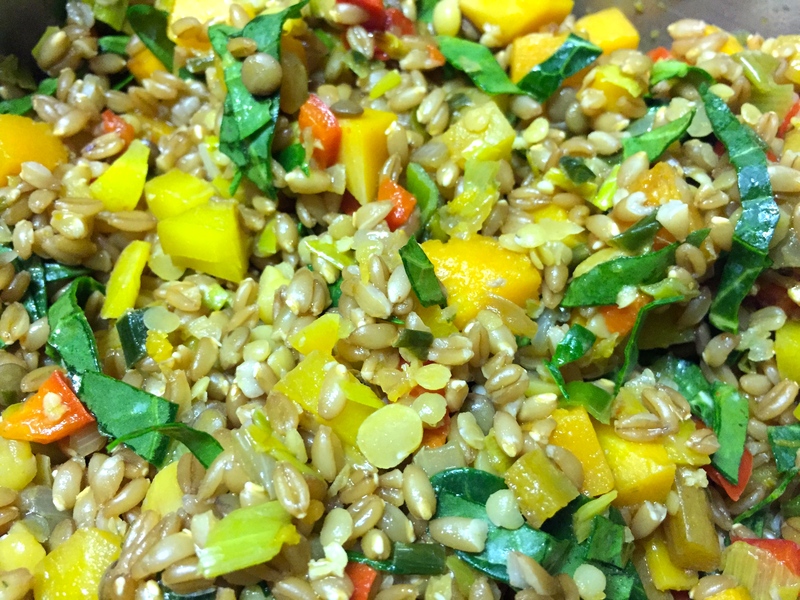 I like farro and it is one of the few “exotic” grains that my kids will eat, too. I’m always looking for new recipes using this grain. I will definitely try this, it looks yummy (and healthy, too). Thanks for sharing. HI Tammy, How lucky to have Hayden Flour Mills making farro. Thanks for sharing the important nutritional info about it. In middle Tennessee, we have a couple of mills that grind organic corn into excellent grits and meal. Anson Mills in South Carolina has brought back Carolina Gold rice, along with a host of other “lost” grains. their products are so so good. The Hayden Flour Mills have a great story! Even though they were here years ago, two years ago at our Farmer-Chef connection, an entrepreneur came with a chair and two table tents – one said, ” I need a place to grow this grain”. The other said, “I need restaurants who will buy this.” The net-net has been fabulous! What an interesting recipe, it looks very inviting, so colorful and tasty. I have never tasted “farro” although I regularly cook barley. Thank you Tammy for always bringing something different into our plates. I know you would love the farro and I’m told that they eat it often in Italy. Looks amazing. I think I’ve seen it in my local health store so I’ll give it a try. Thanks! Let me know if you do try it. Please do and tell me if you enjoy it.